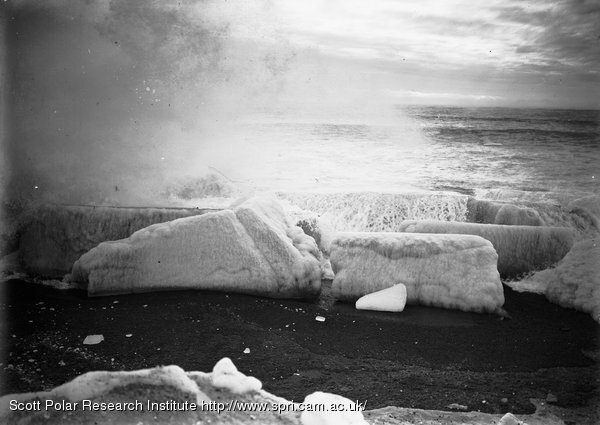 You are currently browsing the Scott's Last Expedition blog archives for February, 1911. Safety Camp. Packed up at 6 A.M. and marched into Safety Camp. Found everyone very cold and depressed. 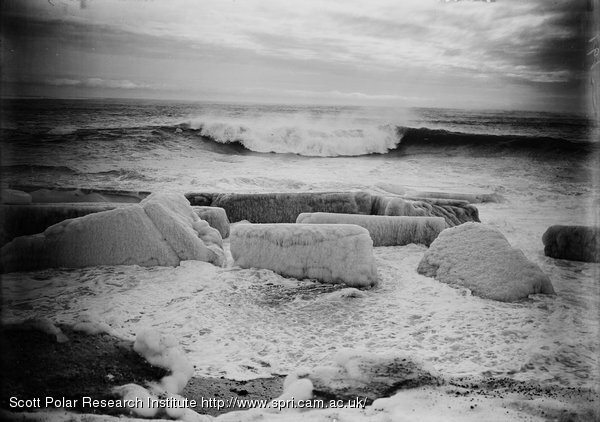 Wilson and Meares had had continuous bad weather since we left, Bowers and Oates since their arrival. The blizzard had raged for two days. The animals looked in a sorry condition but all were alive. The wind blew keen and cold from the east. 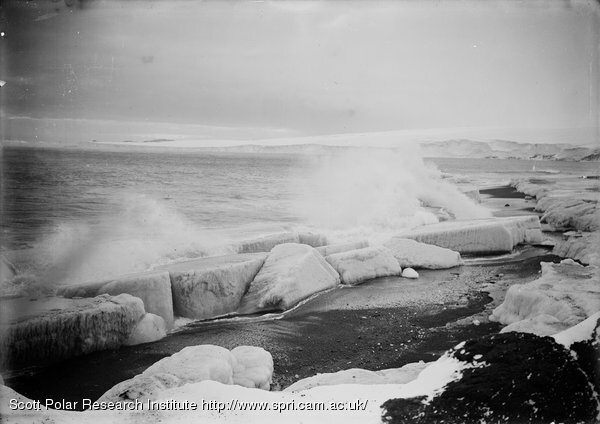 There could be no advantage in waiting here, and soon all arrangements were made for a general shift to Hut Point. Packing took a long time. 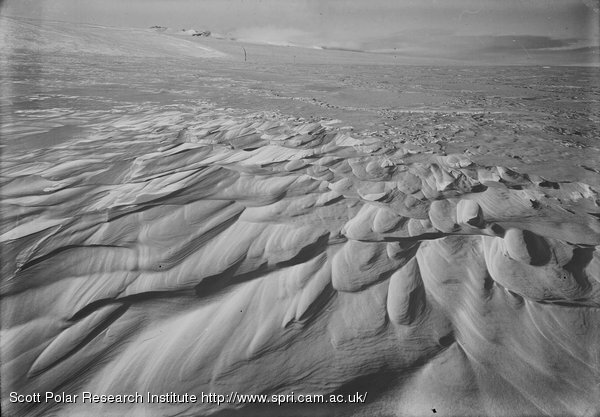 The snowfall had been prodigious, and parts of the sledges were 3 or 4 feet under drift. About 4 o’clock the two dog teams got safely away. Then the pony party prepared to go. As the clothes were stripped from the ponies the ravages of the blizzard became evident. The animals without exception were terribly emaciated, and Weary Willy was in a pitiable condition. The plan was for the ponies to follow the dog tracks, our small party to start last and get in front of the ponies on the sea ice. 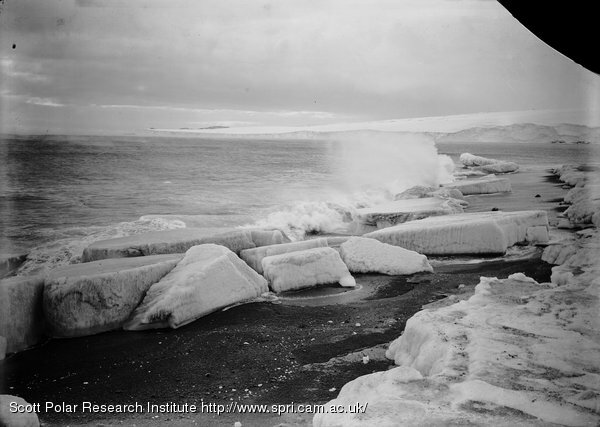 I was very anxious about the sea ice passage owing to the spread of the water holes. The ponies started, but Weary Willy, tethered last without a load, immediately fell down. We tried to get him up and he made efforts, but was too exhausted. Then we rapidly reorganised. Cherry-Garrard and Crean went on whilst Oates and Gran stayed with me. We made desperate efforts to save the poor creature, got him once more on his legs and gave him a hot oat mash. 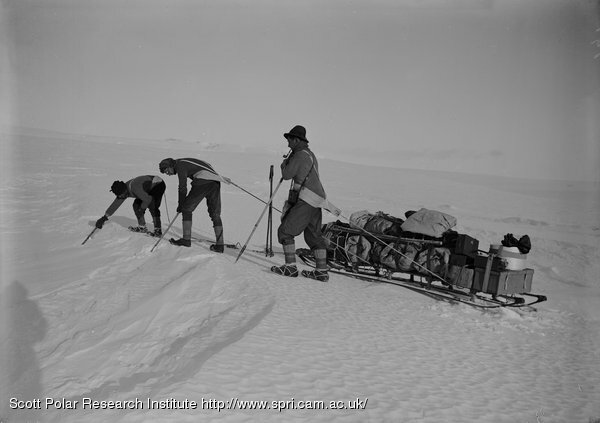 Then after a wait of an hour Oates led him off, and we packed the sledge and followed on ski; 500 yards away from the camp the poor creature fell again and I felt it was the last effort. We camped, built a snow wall round him, and did all we possibly could to get him on his feet. Every effort was fruitless, though the poor thing made pitiful struggles. Towards midnight we propped him up as comfortably as we could and went to bed. 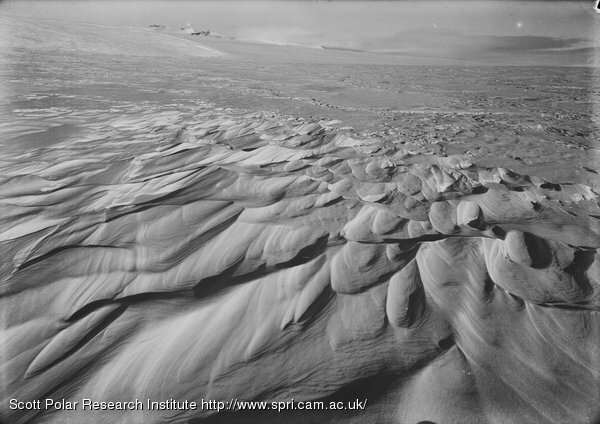 Awoke to find it blowing a howling blizzard – absolutely confined to tent at present – to step outside is to be covered with drift in a minute. We have managed to get our cooking things inside and have had a meal. Very anxious about the ponies – am wondering where they can be. The return party has had two days and may have got them into some shelter – but more probably they were not expecting this blow – I wasn’t. The wind is blowing force 8 or 9; heavy gusts straining the tent; the temperature is evidently quite low. This is poor luck. Marched on Corner Camp, but second main party found going very hard and eventually got off their ski and pulled on foot. James Pigg also found the surface bad, so we camped and had lunch after doing 3 miles. Except for our tent the camp routine is slack. Shall have to tell people that we are out on business, not picnicking. It was another 3 miles to depot after lunch. Found signs of Bowers’ party having camped there and glad to see five pony walls. Left six full weeks’ provision: 1 bag of oats, 3/4 of a bale of fodder. Then Cherry-Garrard, Crean, and I started for home, leaving the others to bring the pony by slow stages. We covered 6 1/4 miles in direct line, then had some tea and marched another 8. We must be less than 10 miles from Safety Camp. Pitched tent at 10 P.M., very dark for cooking. Fine bright day – easy marching – covered 9 miles and a bit yesterday and the same to-day. Should reach Corner Camp before lunch to-morrow. Turned out at 3 A.M. and saw a short black line on the horizon towards White Island. Thought it an odd place for a rock exposure and then observed movement in it. Walked 1 1/2 miles towards it and made certain that it was Oates, Bowers, and the ponies. They seemed to be going very fast and evidently did not see our camp. To-day we have come on their tracks, and I fear there are only four ponies left. James Pigg, our own pony, limits the length of our marches. The men haulers could go on much longer, and we all like pulling on ski. Everyone must be practised in this. Roused out at 6. Started marching at 9. 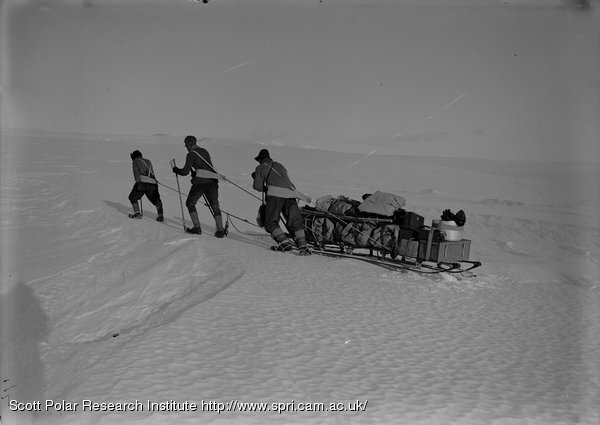 Self, Crean, and Cherry-Garrard one sledge and tent; Evans, Atkinson, Forde, second sledge and tent; Keohane leading his pony. We pulled on ski in the forenoon; the second sledge couldn’t keep up, so we changed about for half the march. In the afternoon we pulled on foot. On the whole I thought the labour greater on foot, so did Crean, showing the advantage of experience. There is no doubt that very long days’ work could be done by men in hard condition on ski. The hanging back of the second sledge was mainly a question of condition, but to some extent due to the sledge. We have a 10 ft., whilst the other party has a 12 ft.; the former is a distinct advantage in this case. It has been a horrid day. We woke to find a thick covering of sticky ice crystals on everything—a frost rime. I cleared my ski before breakfast arid found more on afterwards. There was the suggestion of an early frosty morning at home—such a morning as develops into a beautiful sunshiny day; but in our case, alas! such hopes were shattered: it was almost damp, with temperature near zero and a terribly bad light for travelling. In the afternoon Erebus and Terror showed up for a while. Now it is drifting hard with every sign of a blizzard—a beastly night. This marching is going to be very good for our condition and I shall certainly keep people at it. 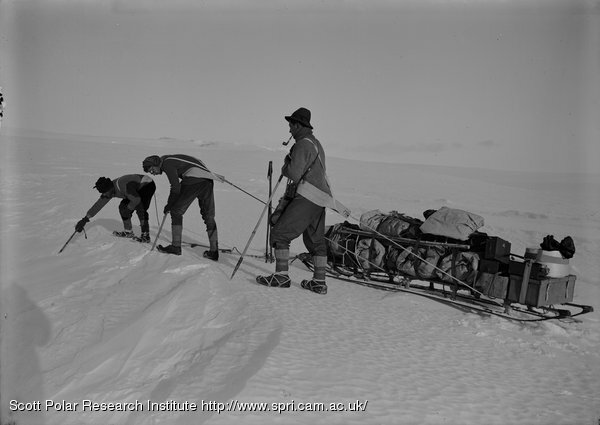 Spent the day preparing sledges, &c., for party to meet Bowers at Corner Camp. It was blowing and drifting and generally uncomfortable. Wilson and Meares killed three seals for the dogs. Safety Camp. Turned out at 11 this morning after 4 hours’ sleep. Wilson, Meares, Evans, Cherry-Garrard, and I went to Hut Point. Found a great enigma. The hut was cleared and habitable – but no one was there. A pencil line on the wall said that a bag containing a mail was inside, but no bag could be found. We puzzled much, then finally decided on the true solution, viz. 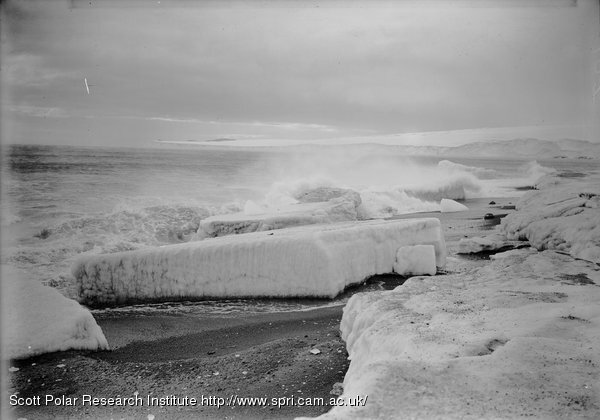 that Atkinson and Crean had gone towards Safety Camp as we went to Hut Point – later we saw their sledge track leading round on the sea ice. Then we returned towards Safety Camp and endured a very bad hour in which we could see the two bell tents but not the domed. 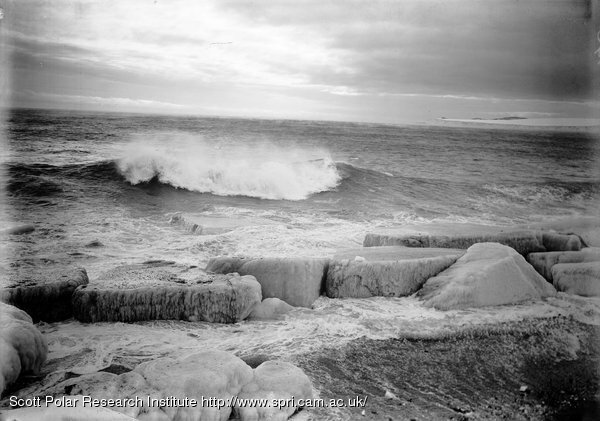 It was an enormous relief to find the dome securely planted, as the ice round Cape Armitage is evidently very weak; I have never seen such enormous water holes off it. 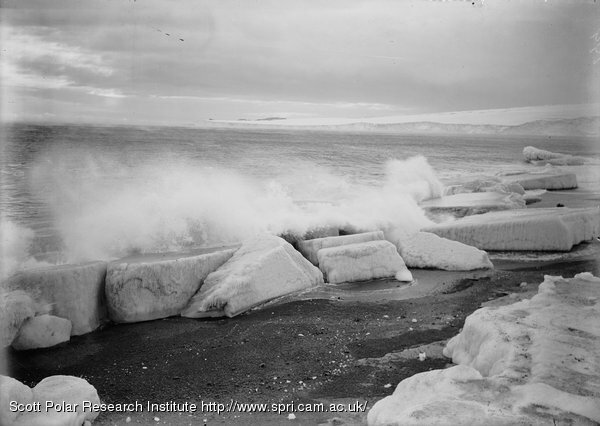 But every incident of the day pales before the startling contents of the mail bag which Atkinson gave me – a letter from Campbell setting out his doings and the finding of Amundsen established in the Bay of Whales. One thing only fixes itself definitely in my mind. The proper, as well as the wiser, course for us is to proceed exactly as though this had not happened. To go forward and do our best for the honour of the country without fear or panic. There is no doubt that Amundsen’s plan is a very serious menace to ours. He has a shorter distance to the Pole by 60 miles – I never thought he could have got so many dogs safely to the ice. His plan for running them seems excellent. But above and beyond all he can start his journey early in the season – an impossible condition with ponies. 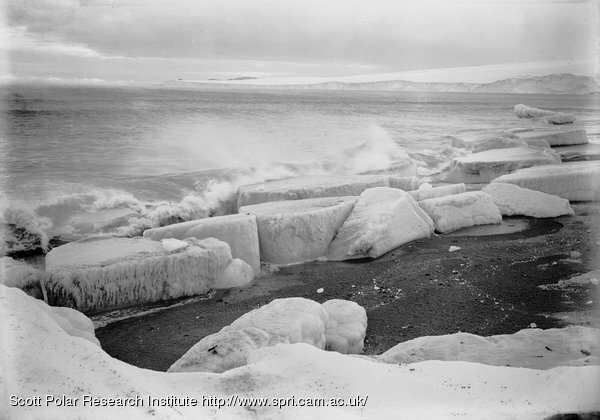 The ice is still in at the Glacier Tongue: a very late date – it looks as though it will not break right back this season, but off Cape Armitage it is so thin that I doubt if the ponies could safely be walked round. Safety Camp. Got away at 10 again: surface fairly heavy: dogs going badly. The dogs are as thin as rakes; they are ravenous and very tired. I feel this should not be, and that it is evident that they are underfed. The ration must be increased next year and we _must_ have some properly thought out diet. The biscuit alone is not good enough. Meares is excellent to a point, but ignorant of the conditions here. One thing is certain, the dogs will never continue to drag heavy loads with men sitting on the sledges; we must all learn to run with the teams and the Russian custom must be dropped. Meares, I think, rather imagined himself racing to the Pole and back on a dog sledge. This journey has opened his eyes a good deal. We reached Safety Camp (dist. 14 miles) at 4.30 A.M.; found Evans and his party in excellent health, but, alas! with only ONE pony. As far as I can gather Forde’s pony only got 4 miles back from the Bluff Camp; then a blizzard came on, and in spite of the most tender care from Forde the pony sank under it. Evans says that Forde spent hours with the animal trying to keep it going, feeding it, walking it about; at last he returned to the tent to say that the poor creature had fallen; they all tried to get it on its feet again but their efforts were useless. It couldn’t stand, and soon after it died. Then the party marched some 10 miles, but the blizzard had had a bad effect on Blossom – it seemed to have shrivelled him up, and now he was terribly emaciated. After this march he could scarcely move. Evans describes his efforts as pathetic; he got on 100 yards, then stopped with legs outstretched and nose to the ground. They rested him, fed him well, covered him with rugs; but again all efforts were unavailing. The last stages came with painful detail. So Blossom is also left on the Southern Road. The last pony, James Pigg, as he is called, has thriven amazingly – of course great care has been taken with him and he is now getting full feed and very light work, so he ought to do well. The loss is severe; but they were the two oldest ponies of our team and the two which Oates thought of least use. Atkinson and Crean have departed, leaving no trace – not even a note. Crean had carried up a good deal of fodder, and some seal meat was found buried. After a few hours’ sleep we are off for Hut Point. There are certain points in night marching, if only for the glorious light effects which the coming night exhibits. New Camp about 12 miles from Safety Camp. 15 1/2 miles. We made a start as usual about 10 P.M. The light was good at first, but rapidly grew worse till we could see little of the surface. The dogs showed signs of wearying. About an hour and a half after starting we came on mistily outlined pressure ridges. We were running by the sledges. 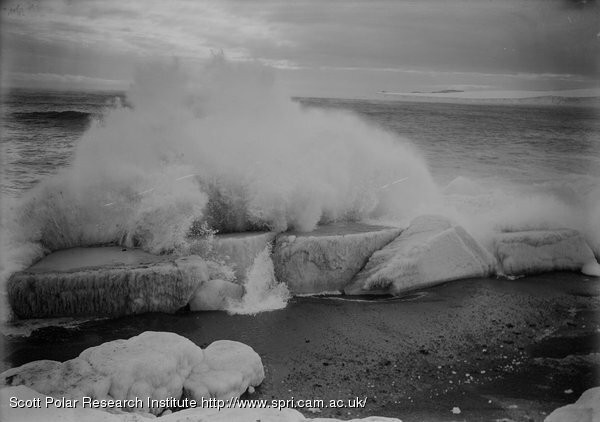 Suddenly Wilson shouted ‘Hold on to the sledge,’ and I saw him slip a leg into a crevasse. I jumped to the sledge, but saw nothing. Five minutes after, as the teams were trotting side by side, the middle dogs of our team disappeared. 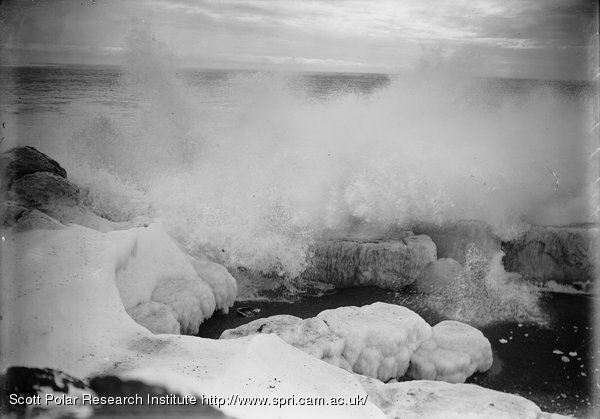 In a moment the whole team were sinking – two by two we lost sight of them, each pair struggling for foothold. Osman the leader exerted all his great strength and kept a foothold – it was wonderful to see him. The sledge stopped and we leapt aside. The situation was clear in another moment. We had been actually travelling along the bridge of a crevasse, the sledge had stopped on it, whilst the dogs hung in their harness in the abyss, suspended between the sledge and the leading dog. Why the sledge and ourselves didn’t follow the dogs we shall never know. I think a fraction of a pound of added weight must have taken us down. As soon as we grasped the position, we hauled the sledge clear of the bridge and anchored it. Then we peered into the depths of the crack. The dogs were howling dismally, suspended in all sorts of fantastic positions and evidently terribly frightened. Two had dropped out of their harness, and we could see them indistinctly on a snow bridge far below. The rope at either end of the chain had bitten deep into the snow at the side of the crevasse, and with the weight below, it was impossible to move it. By this time Wilson and Cherry-Garrard, who had seen the accident, had come to our assistance. At first things looked very bad for our poor team, and I saw little prospect of rescuing them. I had luckily inquired about the Alpine rope before starting the march, and now Cherry-Garrard hurriedly brought this most essential aid. It takes one a little time to make plans under such sudden circumstances, and for some minutes our efforts were rather futile. 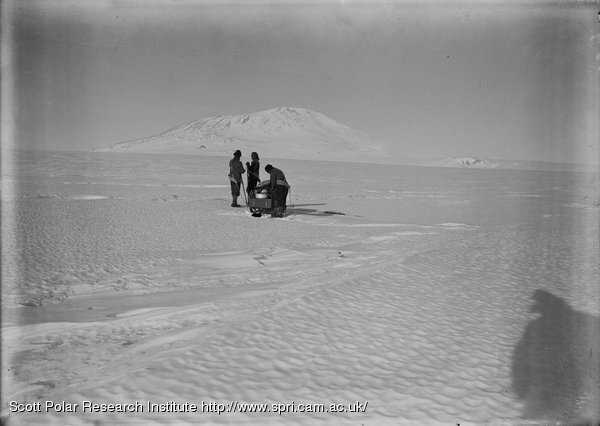 We could get not an inch on the main trace of the sledge or on the leading rope, which was binding Osman to the snow with a throttling pressure. Then thought became clearer. 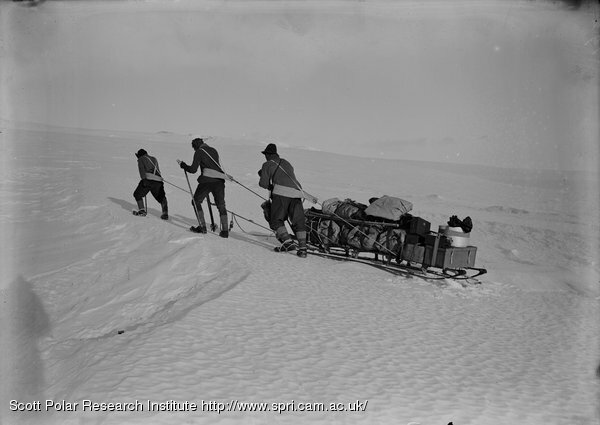 We unloaded our sledge, putting in safety our sleeping-bags with the tent and cooker. Choking sounds from Osman made it clear that the pressure on him must soon be relieved. 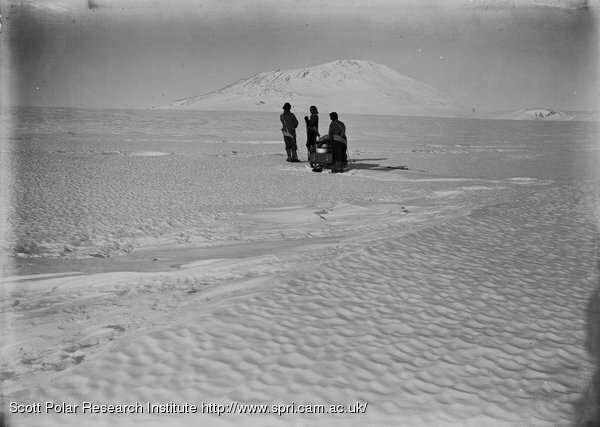 I seized the lashing off Meares’ sleeping-bag, passed the tent poles across the crevasse, and with Meares managed to get a few inches on the leading line; this freed Osman, whose harness was immediately cut. Then securing the Alpine rope to the main trace we tried to haul up together. One dog came up and was unlashed, but by this time the rope had cut so far back at the edge that it was useless to attempt to get more of it. But we could now unbend the sledge and do that for which we should have aimed from the first, namely, run the sledge across the gap and work from it. We managed to do this, our fingers constantly numbed. Wilson held on to the anchored trace whilst the rest of us laboured at the leader end. The leading rope was very small and I was fearful of its breaking, so Meares was lowered down a foot or two to secure the Alpine rope to the leading end of the trace; this done, the work of rescue proceeded in better order. Two by two we hauled the animals up to the sledge and one by one cut them out of their harness. Strangely the last dogs were the most difficult, as they were close under the lip of the gap, bound in by the snow-covered rope. Finally, with a gasp we got the last poor creature on to firm snow. We had recovered eleven of the thirteen. Then I wondered if the last two could not be got, and we paid down the Alpine rope to see if it was long enough to reach the snow bridge on which they were coiled. The rope is 90 feet, and the amount remaining showed that the depth of the bridge was about 65 feet. I made a bowline and the others lowered me down. The bridge was firm and I got hold of both dogs, which were hauled up in turn to the surface. Then I heard dim shouts and howls above. Some of the rescued animals had wandered to the second sledge, and a big fight was in progress. All my rope-tenders had to leave to separate the combatants; but they soon returned, and with some effort I was hauled to the surface. All is well that ends well, and certainly this was a most surprisingly happy ending to a very serious episode. We felt we must have refreshment, so camped and had a meal, congratulating ourselves on a really miraculous escape. If the sledge had gone down Meares and I _must_ have been badly injured, if not killed outright. The dogs are wonderful, but have had a terrible shaking – three of them are passing blood and have more or less serious internal injuries. Many were held up by a thin thong round the stomach, writhing madly to get free. One dog better placed in its harness stretched its legs full before and behind and just managed to claw either side of the gap – it had continued attempts to climb throughout, giving vent to terrified howls. Two of the animals hanging together had been fighting at intervals when they swung into any position which allowed them to bite one another. The crevasse for the time being was an inferno, and the time must have been all too terribly long for the wretched creatures. It was twenty minutes past three when we had completed the rescue work, and the accident must have happened before one-thirty. Some of the animals must have been dangling for over an hour. I had a good opportunity of examining the crack. The section seemed such as I have shown. It narrowed towards the east and widened slightly towards the west. In this direction there were curious curved splinters; below the snow bridge on which I stood the opening continued, but narrowing, so that I think one could not have fallen many more feet without being wedged. Twice I have owed safety to a snow bridge, and it seems to me that the chance of finding some obstruction or some saving fault in the crevasse is a good one, but I am far from thinking that such a chance can be relied upon, and it would be an awful situation to fall beyond the limits of the Alpine rope. 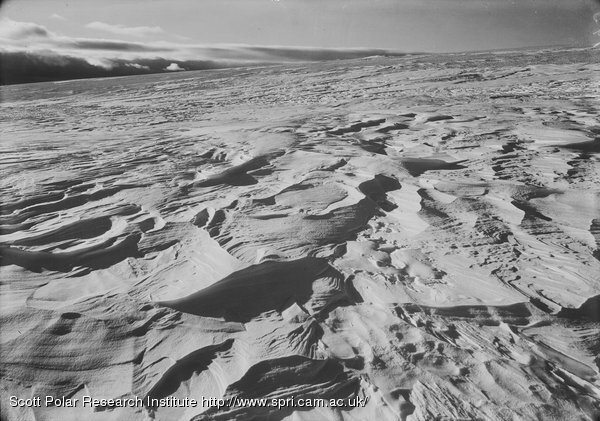 We went on after lunch, and very soon got into soft snow and regular surface where crevasses are most unlikely to occur. We have pushed on with difficulty, for the dogs are badly cooked and the surface tries them. We are all pretty done, but luckily the weather favours us. A sharp storm from the south has been succeeded by ideal sunshine which is flooding the tent as I write. It is the calmest, warmest day we have had since we started sledging. We are only about 12 miles from Safety Camp, and I trust we shall push on without accident to-morrow, but I am anxious about some of the dogs. We shall be lucky indeed if all recover. My companions to-day were excellent; Wilson and Cherry-Garrard if anything the most intelligently and readily helpful. 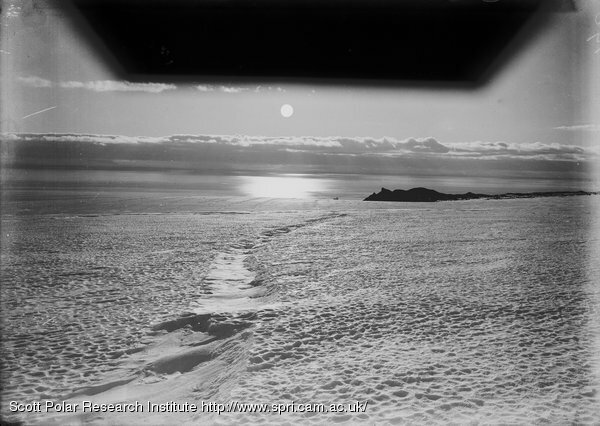 I begin to think that there is no avoiding the line of cracks running from the Bluff to Cape Crozier, but my hope is that the danger does not extend beyond a mile or two, and that the cracks are narrower on the pony road to Corner Camp. If eight ponies can cross without accident I do not think there can be great danger. Certainly we must rigidly adhere to this course on all future journeys. We must try and plot out the danger line. I begin to be a little anxious about the returning ponies. I rather think the dogs are being underfed – they have weakened badly in the last few days – more than such work ought to entail. Now they are absolutely ravenous. Meares has very dry feet. Whilst we others perspire freely and our skin remains pink and soft his gets horny and scaly. He amused us greatly to-night by scraping them. The sound suggested the whittling of a hard wood block and the action was curiously like an attempt to shape the feet to fit the finnesko! Distances in Geographical Miles. Variation 152 E.
5 to 6 S. 48 E. 10 270 Var. 149 1/2 E.
Bluff Camp 10 to 11 S. 10 226 Var. 152 1/2 E.
29 miles. Lunch. 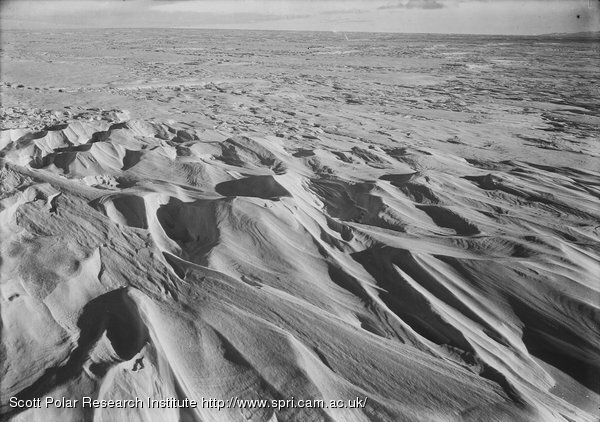 Excellent run on hard wind-swept surface – covered nearly seventeen miles. Very cold at starting and during march. Suddenly wind changed and temperature rose so that at the moment of stopping for final halt it appeared quite warm, almost sultry. On stopping found we had covered 29 miles, some 35 statute miles. The dogs are weary but by no means played out – during the last part of the journey they trotted steadily with a wonderfully tireless rhythm. I have been off the sledge a good deal and trotting for a good many miles, so should sleep well. E. Evans has left a bale of forage at Camp 8 and has not taken on the one which he might have taken from the depôt – facts which show that his ponies must have been going strong. I hope to find them safe and sound the day after to-morrow. We had the most wonderfully beautiful sky effects on the march with the sun circling low on the southern horizon. Bright pink clouds hovered overhead on a deep grey-blue background. Gleams of bright sunlit mountains appeared through the stratus. Here it is most difficult to predict what is going to happen. Sometimes the southern sky looks dark and ominous, but within half an hour all has changed – the land comes and goes as the veil of stratus lifts and falls. 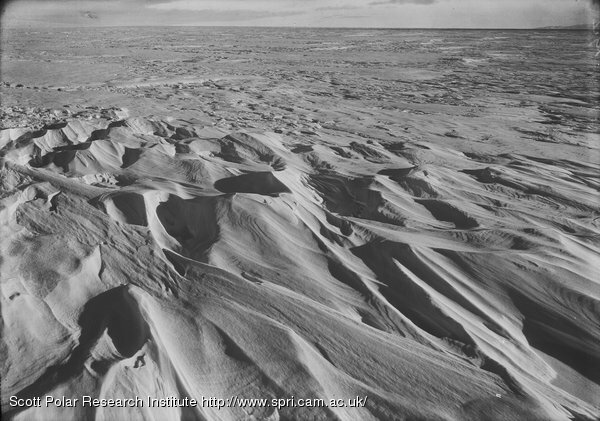 It seems as though weather is made here rather than dependent on conditions elsewhere. It is all very interesting.